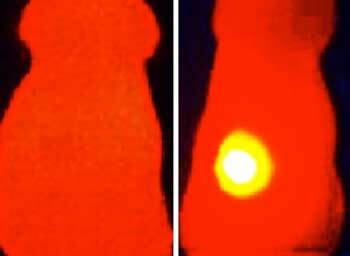 (Nanowerk News) The dark skin pigment melanin protects us from the sun’s damaging rays by absorbing light energy and converting it to heat. This could make it a very effective tool in tumor diagnosis and treatment, as demonstrated by a team from the Technical University of Munich (TUM) and Helmholtz Zentrum München. The scientists managed to create melanin-loaded cell membrane derived nanoparticles, which improved tumor imaging in an animal model while also slowing the growth of the tumor (Nature Communications, "Bioengineered bacterial vesicles as biological nanoheaters for optoacoustic imaging"). Nanoparticles are considered a promising weapon in the fight against tumors due to the fact that tumor tissue absorbs them more readily than healthy cells because their vascular system is more permeable. A good example is provided by outer membrane vesicles (OMVs), which are basically small bubbles surrounded by bacterial membrane. These 20- to 200-nanometer particles are of interest because they are biocompatible, biodegradable and can be easily and inexpensively produced in bacteria, even in large volumes. Once loaded with medicinal active agents, they are easy to administer. Optoacoustics, a method which has been significantly advanced by Ntziachristos, combines the benefits of optical imaging and ultrasound technology. Weak laser pulses gently heat the tissue, causing it to briefly expand very slightly. Ultrasound signals are produced when the tissue contracts again as it cools down. The measured signals vary depending on the tissue type. The scientists record them with special detectors and “translate” them into three-dimensional images. Sensor molecules or probes (such as OMVs) can improve the specificity and accuracy of the technique even further. The scientists initially had to overcome a problem specific to melanin: It is not very water-soluble and therefore difficult to administer. This is where the OMVs came into play. The researchers engineered bacteria in such a way that they produce melanin and store it in their membrane derived nanoparticles. They then tested the black nanoparticles in mice which had tumors in their lower back region. The particles were injected directly into the tumor, which was excited with infrared laser pulses as part of the optoacoustic procedure. OMVs proved to be suitable sensor probes for this diagnosis technique because they delivered sharp, high-contrast images of the tumor. They are also well-suited to photothermal therapy approaches, where the tumor tissue is heated with stronger laser pulses in order to kill the cancer cells. The melanin in the nanoparticles caused the temperature of the tumor tissue to rise from 37°C to up to 56°C. Control tumors with no melanin only reached a maximum temperature of 39°C. In the ten days following the treatment, the tumors grew at a significantly slower rate than those in the control group that had not received melanin OMVs. This heat effect was amplified by another positive effect of the particles: By causing a slight non-specific inflammation in the tumor tissue, the immune system was triggered to attack the tumor. “Our melanin nanoparticles fit into the new medical field of theranostics – where therapy and diagnostics are combined. This makes them a highly interesting option for use in clinical practice,” says Ntziachristos. The scientists will now develop their OMVs further to bring them into clinical use in the future.